AdGuard Memory Usage Is Too High! Discussion in 'Technical Support (AdGuard for Windows)' started by november_ra1n, Mar 24, 2014. Firstly thank you for the great popup/add remover. I have used AdMuncher last 4 years but i have just moved to Adguard for testing. My main worry is Memory usage too high. 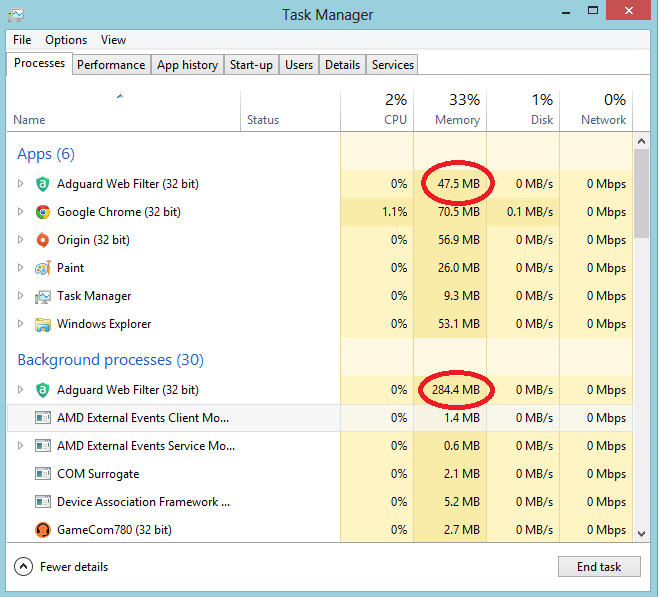 This makes program eating a lot of memory [92.5 MB] beside makes heavy on the system comparing AM was only 9 MB. I am also member of one of the busy forum other members have same issiue. I was wondering if developer trying to cut down memory usage dramatically? Apart from this biggest worry program working wonderfully. Well, due to its development nature, higher memory usage for Adguard is probably normal. And to be honest, personally, these days I'd not actually call it using up-to 200MB of memory high considering modern web browsers and other popular applications like media players tend to use at least that much if not more than that and that newer PCs contain at least 4GB of RAM. This is not web-browser it is a popup/add blocker. 95 MB is too high considering AdMuncher was using only 9 MB memory and doing the similar job. Even my Kaspersky Anti-Virus software control everything in my PC and use 50 MB memory. Yet Chrome/Firefox tends to use more memory than that - it doesn't matter if it's just a popup/ad blocker, I was generalizing to all applications as a comparison. I'm pretty sure it's normal. I *could* be wrong, and avatar should say something on this matter, but I wouldn't be surprised if it's considered normal. EDIT: Thinking about this more, it may be possible to reduce the usage to an extent but it'll probably spike when filtering 'heavy elements' like Flash, Java, etc. and when trying to load multiple websites at the same time. I'm not sure how much garbage collection is used in Adguard, but it could potentially be possible to regain resources used that way, especially after a spike in usage when visiting applet-heavy sites or after loading multiple sites at once. A browser and this application are completely different one is downloading and displaying the information and the other is blocking the information so nothing is stored as it should just be injecting the blocking code it does seem quite high. On my screen now its 62.8 + 52.4 = 115.2mb. On the contrary, Adguard has to intercept and process that inbound (downloaded) and probably outbound data on-the-fly and pass it along to the browser so it can draw it as fast/soon as possible. While, sure, the browser is doing a lot of the browsing work but Adguard has to keep up with if not match the browser in speed. You'll notice a small slowdown in loading pages when using Adguard versus without. Intercepting and blocking elements isn't the same as displaying those elements, while adguard is doing alot by reading the traffic and then deciding what to block the usage is still high like rain has said, as for slow down i dont notice anything i have fast internet and decent laptop i just find ads about things im not interested in annoying like everyone else that actually pays for an adblocker or uses a free alternative like adblock/adblock plus. We'll try to cut down memory usage in Adguard 6.0 but I am sure we would not cut it to 15 Mb. avator this is one of the reason i never used Adblock i used to be a AdMuncher man but sadly developer support interest with his application. I have been using Adguard last 7 days and reading about it a lot of topic about it. All i say and see that everyone suffering about high CPU usage apart from that its wonderful software and thanks to you keep updating and developing. As I've said, we will cut it down. But we cannot make memory usage our top priority. We are trying to keep balance between memory/CPU usage, filtering speed and development speed. I read on another forum that memory usage would be cut hopefully starting in v6 of the application and like you said it was not a priority. As for the screenshot avatar you are showing the extension, rain is on about the application. Avatar was comparing the Adblock Plus extension for Chrome vs Adguard on Windows as an example. And what im saying is its a bad example as he has purposely chosen the extension and said "we are doing better than our competitors" yu can not deny that when its there in black and white. This is not normal situation. Which ad filters are enabled? Which browsing security filters are enabled? Could you send us Adguard log files? Hi avatar could it be that i do quite alot of browsing during the day? its currently 43.5mb and 266.1mb. Log files? looking into this now. It should release unused memory periodically. How much total memory your computer has? Does restart of Adguard Service return memory usage back to normal? Im going to look into my computer when i get chance first thing is to figure out why the uptime is wrong on daily shut downs its saying its been on for the past 7 days (no doubt 8days today) i might just re-install it all its been 4 months and has a few issues. Figured out why my computer was not shutting down properly it was due to Windows 8 Fast start up.